A Banquet of Consequences: A Lynley Novel (Hardcover) | Eagle Harbor Book Co.
A suicide, a murder or two, and a cast of complicated characters in a very dysfunctional family—all add up to another satisfying, multi-layered mystery solved by Inspector Thomas Lynley and Detective Sergeant Barbara Havers! The #1 New York Times bestselling author’s award-winning series returns with another stunning crime drama featuring Scotland Yard members Detective Inspector Thomas Lynley and Detective Sergeant Barbara Havers. Look out for Elizabeth George’s newest novel, The Punishment She Deserves. 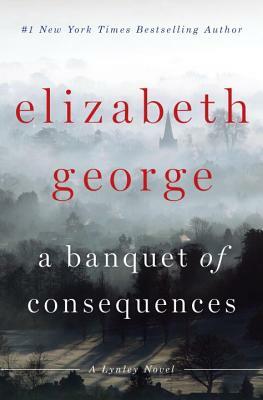 Elizabeth George is the New York Times bestselling author of nineteen psychological suspense novels, three young adult novels, one book of nonfiction, and two short-story collections. Her work has been honored with the Anthony and Agatha awards, as well as several other prestigious prizes. She lives in Washington State. "Elizabeth George is a superstar of the crime-fiction world, British Inspector Division. Deservedly so: Her tales always provide nuanced character studies and insights into social issues along with their intricate mysteries." "It’s tough to resist the pull of [George’s] storytelling once hooked." "Ms. George can do it all, with style to spare." "George's . . . ability to continually enhance the portraits of Lynley, Havers, and other recurring characters while generating fully fleshed new ones for each novel is nothing less than superlative, and her atmospheric prose, complete with lovely and detailed descriptions of her setting, combines to add literary gravitas to her work . . . A worthy addition to her portfolio and one that simultaneously disturbs and satisfies." "[Lynley is] one of the great character portraits in contemporary crime fiction."